Education and poverty exist in a highly contested relationship even in the developed world. On the one hand, educational outcomes seem solidly attached to socio-economic status, and on the other, education is often cited as a way out of poverty. Success at de-coupling poverty from educational outcomes varies across the developed world. The issues connecting education and poverty are complex, but the question of the successful engagement of students from poor backgrounds involves a complex mix of public policy on poverty, public policy on education, and teacher action. This book focuses on a number of exemplary teachers who demonstrate a set of common pedagogical qualities, assisting them to work productively with persistent classroom challenges in low SES classrooms. Exemplary Teachers of Students in Poverty shares successful classroom practice from schools serving diverse and disadvantaged communities, and stresses that opportunities in school can influence educational engagement and encourage students to achieve. 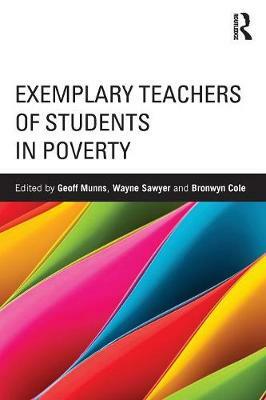 The text locates itself in international debates about education and poverty, and reports on the Teachers for a Fair Go project - an Australian research project into the work of a number of teachers who were successful at engaging students from poor backgrounds. Exemplary Teachers of Students in Poverty will greatly benefit researchers, teacher educators and trainee teachers, allowing them to gain a much deeper understanding of the issues, constraints and perspectives in teaching contexts across low SES communities.